Margaret Elphinstone lives once more in Galloway where she was working as a gardener when her first novel was published in 1987. She is the author of eight novels as well as poetry and short stories. She is a graduate of Durham University and an Emeritus Professor of Strathclyde University where she was a member of the English Studies Department from 1990-2008. Apart from spells of academic work in the USA, she has spent her working life in Scotland including Shetland, Edinburgh, Glasgow, and Moray. 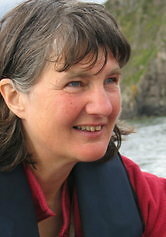 She has been appointed an Honorary Fellow of the Association of Scottish Literary Studies.